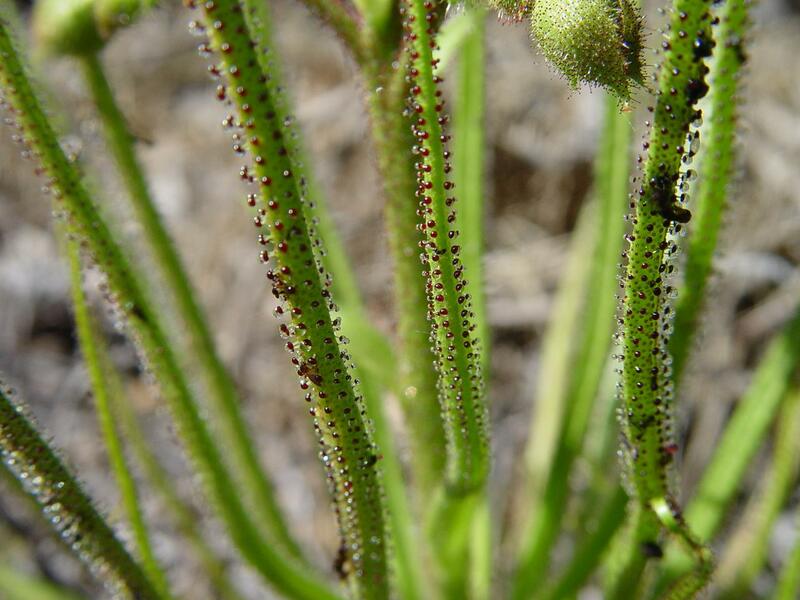 Commonly called Portuguese Sundew or Dewy Pine, the Drosophyllum lusitanicum carnivorous plant is considered to be one of the most successful in the insectivorous fauna world. It has the ability to attract, capture and consume copious amounts of insects using an extremely effective passive trapping methods. In fact, it’s ability to capture prey is so effective that it’s leaves are often smothered by insects. Buy Drosophyllum lusitanicum seed from the FlytrapStore. Drosophyllum naturally occurs in the southern coastal region of Portugal and thrives in arid climates. This differs vastly from the humid savanna of the coastal Eastern United States or tropical rain forests of the South Pacific. The ability of this plants to maintain dewy leaves in the hot semi-desert region is a marvel in its own rite but it is assumed that the daily fog from the Atlantic ocean helps to invigorate and maintain its summer growth. Drosophyllum typically enjoys wet winter and spring months and in April and May mature plants send out large wonderful yellow flowers. The flowers are only open for a few hours and are self pollinating but in cultivation hand pollination induces a higher seed count. Each flower produces a translucent seed pod that crack open after the black pear shaped seeds ripen. Strewn by the wind seeds lay dormant on the dry earth for months until the fall rains return. After germination Drosophyllum quickly sends roots deep into the rocky soil and produces its first fully functioning leaves. The hardened black seed husks are very strong and offer good protection to the fragile interior from wild fires and drought common to southern Portugal. Leaves are linear in shape similar to long pine needles. They will grow 10cm to 30cm in length. Glands on small non-moving tentacles turn crimson in good light conditions. These tentacles secrete droplets of mucilage that is fragrant with the smell of fresh honey and capable of subduing all sizes of prey. Once a insect contacts the leaf, it starts pulling off droplets of mucilage from each gland. Larger insects contact more glands as it struggles along the leaf. The wetting droplets flow over the victim body and eventually block its ability to move and breath. After the insect dies, sessile glands release digestive enzymes and digest its victim. Its capture method is so effective that leaves are often blackened with prey. Fortunately for the Drosophyllum, after strong rains the leaves are washed clean and the process is renewed. It is not uncommon to see digested insect exoskeletons strewn around the plants base. This may also further serve to supply the plant nutrients via the root system. Eventually individual leaves die and droop downward. New leaves are continuously produced and un-spiral upward similar to a octopus stretching out an arm. 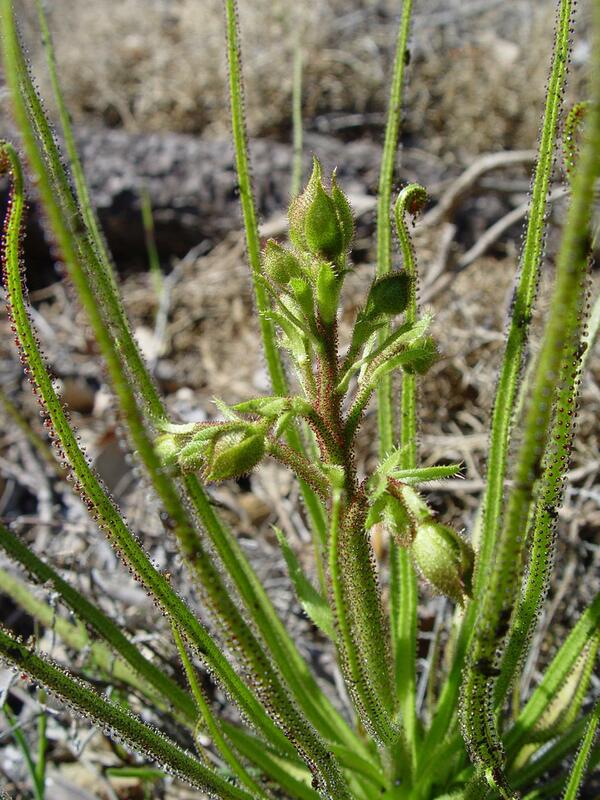 Drosophyllum lusitanicum are rarely found for sale except at a few carnivorous plant nurseries. Shipping will typically shock and kill the plants because the root system do not tolerate being disturbed. For this reason most plants are started from seed in the pot that the plant will spend its adult life in. Transplanting mature plants is not usually successful. It is unknown how long the plants live. Dewy Pines will live as an annual or bi-annual if they are watered year round. If the soil is allowed to dry during the summers season, (after the plant is through flowering) the plants may grow for many years. The poor soil requirements for Drosophyllum consist of rock, Vermiculite, course sand, perlite and peat or humus soil. Equal parts sand, vermiculite, perlite and/or pumice rock and a pinch of peat. The planting container should be 25cm, (ten inches) or larger made of plastic , terracotta or ceramic. Larger pots will produce larger plants that will vigorously grow for many years. Water with rain or distilled water. During the first year of growth it is fine to keep the soil slightly damp during the summer months. The following years the soil should be allowed to be drier after flowering has ceased. Resume light watering by mid Autumn. The rains will invigorate new growth. High light levels are vital to the plants health. It should see direct sunlight all day. This helps create strong colorful leaves. It is not advisable to grow plants indoors. The grower may have success indoors if grown under high output grow lights. Light winter frosts are common in its natural habitat. Plants are able to survive temperatures as low as -10ºC. The plant will wilt from the cold but will revive if daytime temperatures rise above freezing. Do not subject the plant to temperatures higher than 40ºC during the summer time. No know pests are believed to attack Drosophyllum but plants have been lost to under-soil cutting worms. Starting plants from seed is easy. A seed preparation technique called scarification greatly enhances germination rates. Scarification is performed by removing a small segment of the black husk with a razor blade or scraped away with sand paper. It is best to remove the husk segment from the seeds lower bulbous area. Cut or scrape the black husk away until the seeds white interior becomes visible. It is also advisable to let the seed sit in distilled water for a day or two before sowing. Two or three seeds per pot is recommended. Place the seeds on the surface of the soil and water or mist them daily to hasten germination. Once the seed germinates, it will send a roots deep into the rocky soil and quickly become established .Seedlings will need to be thinned to a single plant per pot. If multiple seedling are left in the same pot their growth may be compromised because of competition. Keep the seedlings moist during the first six months of growth while providing good drainage. It is fine to leave the plant outside during the rains of winter as long as the rain water is allowed to flow freely through the porous soil. After the plant matures it is best to respect the Drosophyllum’s native growing conditions by keep the soil drier. If you live in an area that experiences wet summers then a sunny porch may be a good location. Even though the plant is frost tolerant the Drosophyllum should be protected from extremely cold winter conditions. Unused seeds can be placed into a vial and stored in a refrigerator.